One of our Pandora channels repeatedly plays Philip Glass’s music from the movie soundtrack of The Hours. So, as soon as I began reading it, the intricate notes of the score became a mental accompaniment to the novel. That is, I got an ear worm. I came to the novel with the slight disadvantage of being unfamiliar with Mrs. Dalloway, having been traumatized by To the Lighthouse in a college English class. But you don’t have to be familiar with it to appreciate this lovely, cleverly constructed novel, an homage to Woolf’s own. The novel begins with Virginia Woolf’s suicide. But later it returns to 20 years before, when she is writing Mrs. Dalloway. First, though, we meet a middle-aged woman, Clarissa Vaughn, whose best friend calls her Mrs. Dalloway. Like her namesake, Clarissa is eagerly going out into a crisp, clear morning to buy flowers for her party. This is New York, though, in the late 1990’s, and Clarissa’s party is for her dearest friend Richard, a poet who is dying of AIDS. He has recently been chosen to receive a prestigious prize for poetry, and the ceremony is that night. Back in 1920’s Richmond, England, Virginia Woolf is trying to decide the plot of Mrs. Dalloway. Someone will die, she thinks, but will it be Mrs. Dalloway herself? Woolf also copes with her own fears about her mental state, her yearning to return to living in London, and a visit from her sister Vanessa Bell. In 1950’s Los Angeles, Laura Brown struggles with being a suburban housewife and mother. Although she loves her husband and small son, she feels unsuited to this life. Cunningham presents us with three stories, and a theme of threes recurs. Woolf has bouts of mental illness, Richard suffers from dementia caused by his illness, and Laura is struggling with depression. The jellyfish shapes and voices of Woolf’s migraine visions appear in Richard’s episodes of dementia. And Laura briefly sees a grayish jellyfish cloud floating over her son’s head. A forbidden kiss and the color mustard feature in more than one story. And other links that I will not name are more intrinsic to the plot. The three stories are so cleverly interwoven, we’re not sure if the events of one cause the events of the other. This is a novel of astonishing beauty, cleverly constructed and entertaining. I’m going to find a copy of Mrs. Dalloway. I actually did not realize that this was not written by Virginia Woolf! Anyway, I watched the movie version and earned the ire of my friend haha. She said it was one of the most boring movies she’d ever seen! Oh, you make this sound so good! I will have to bump it up on my list. But, maybe I should read Mrs. Dalloway first, since I have it. You could. I read it second. This is very serendipitous, I was listening to that soundtrack in work last week and I was booking a one woman show called Dalloway about the life of Virginia Woolf! I’ve seen the movie, but have never read the book, it sounds intriguing. A little dance of jubilee over here! Love The Hours, and love Mrs. Dalloway even more. I’ve taught it three or four times, read it dozens — it’s gotten to the point that I know the page numbers for certain lines in my edition. It’s one of the most beautiful novels ever written. I hope you love it! I have read it and just haven’t reviewed it yet. 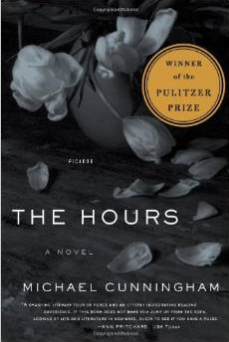 I liked it, but I think I loved The Hours more. With Woolf, there’s always something I feel I’m not getting. But still, great book! Review coming. This really does sound good! I was actually on the plane a couple of a days ago and The Hours was a movie option…I passed when I saw that it was related to Mrs. Dalloway (also negative experience with the book in college). This sounds great though. I think that’s why I avoided reading it for so long. What made me read it was seeing the movie.